Chicken basted with an amazing homemade Fireball BBQ sauce. Ketchup, red pepper jelly, vinegar, onion, garlic, cayenne pepper and Fireball Whiskey. This is SO good! I made this for a party and everyone raved about it! A new favorite! Can make the Fireball BBQ sauce ahead of time and refrigerate for later. We ate this 2 weeks in a row!! I am a big Fireball Whiskey fan. I was turned on to it on a trip to Vegas, and I've never looked back! I am always up to throw back a shot! :) I came across a recipe for Fireball Whiskey Glazed Chicken in one of my magazines and knew I had to give it a try. I made some changes to the recipe to simplify it and make it suit our tastes. OMG! YUM! 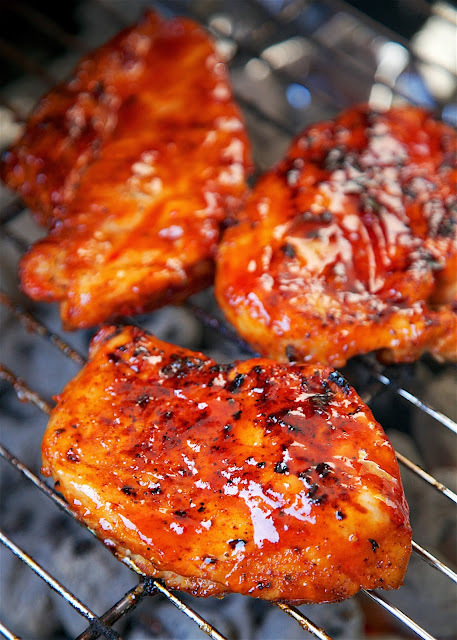 You can make the Fireball Whiskey Glaze ahead of time and just reheat it a bit before cooking the chicken. We seasoned the chicken with a little bit of BBQ seasoning before we threw it on the grill and brushed the Fireball Whiskey Glaze on the chicken a few minutes before it was done cooking. This stuff was ridiculously good. I ate all of my chicken and was wishing I had made extra! Next time! Don't skimp on applying the glaze - it is so good! I wasn't sure that cinnamon whiskey would taste good in a BBQ style glaze, but believe me, it was! This is going into the dinner rotation! In a medium saucepan, whisk together ketchup, red pepper jelly, sugar, cider vinegar, onion powder, garlic powder and cayenne pepper. Bring to a boil, reduce heat to medium and simmer for 3 minutes. Add Fireball Cinnamon Whiskey and simmer 3 to 5 minutes. Remove from heat and set aside. Prepare grill. Season both sides of the chicken with BBQ seasoning. Cook chicken until almost done, approximately 8 to 10 minutes. 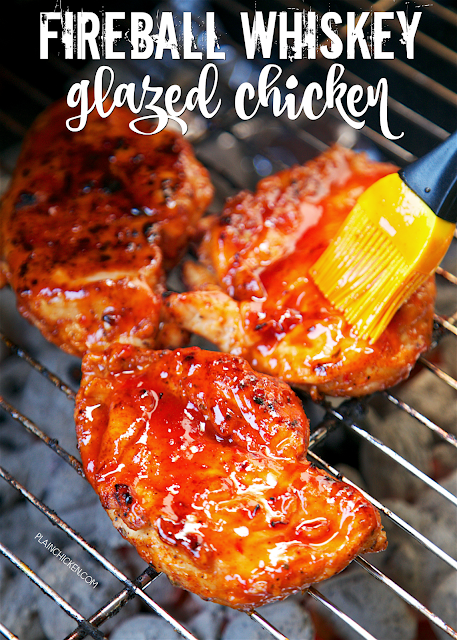 Baste chicken with Fireball Glaze, cook for 2 minutes. Flip chicken, baste again and cook for an additional 2 minutes. Remove chicken from grill. 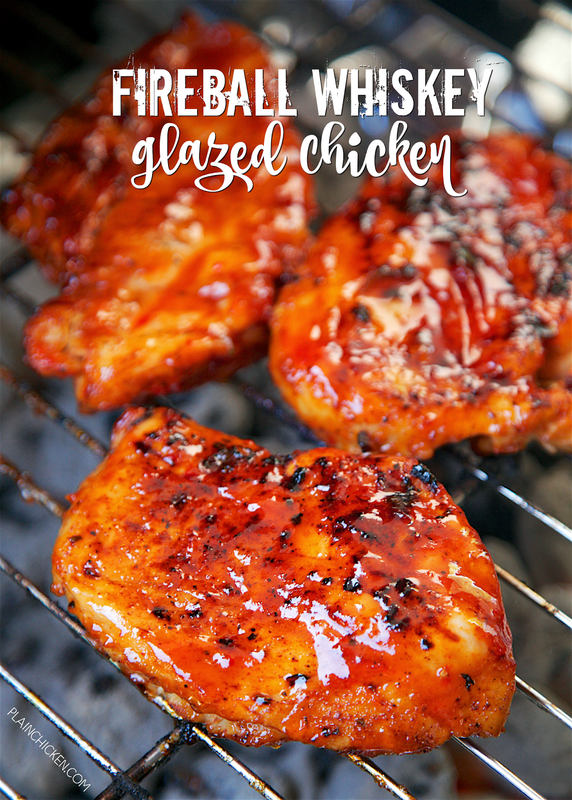 Serve chicken with remaining Fireball Glaze. Sounds great!! I have only recently heard of Fireballs, and this is such a different combo, is super hot? It isn't hot. Fireball is a cinnamon whiskey, so it gives the sauce a unique flavor. It was really good. Hope you enjoy it! So, I'm sure you are not a super huge fan of people asking questions about modifying and/or changing your recipes. . . But, I am allergic to cinnamon (anaphylaxis=epi pen). Do you think this recipe would turn out well with either plain whiskey, Maple, or Apple? Do you have any other suggestions? What I need to add something else for a different flavor? Sometimes during the fall I add clove or not meg to try to make up for the lack of cinnamon. Would one of those solutions work here? I think plain, Apple or maple whiskey would be fine. Enjoy! Is red pepper jelly needed? Yes, that is why I included it in the recipe. I used 2 TBS mango chutney and 2 TBS chilli jelly from the local Indian grocer. It was splendid!